Fedora hats are very stylish but if you are looking for more interesting patterns and designs of such hats, then you should opt for the patterned fedora hats. Patterned Fedora Hats are available in different colors, shapes, and designs. Looking to add the right touch of flair to your outfit? Fans of uniquely-patterned accessories will love Patterned Fedoras. Like the classic Fedoras, patterned fedoras contain a round, tapered hat, with a brim going around the cap, as well as often containing extra ribbon encircling the fedora. Patterned fedoras, however, are a funky spin: the fedora features unique designs. 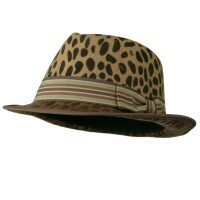 Animal prints such as cheetah, snakeskin, or zebra may be the pattern of the hat. 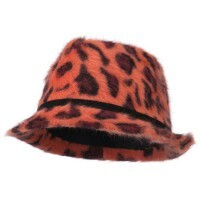 Patterned Fedoras may also be adorned with sequins, glitter stones, and other embellishments. The Patterned Fedora is made with different materials–polyester, microfiber, or even faux fur–which add texture to the already stylish hat. The fedora hat’s history goes back to the beginning of the 20th Century, during which it was popular with both men and women for its stylishness and ability to keep its wearer protected against the weather and wind. Today, the hat is still found to be a favorable accent to an outfit, emanating even more glamour than it did back then with its variety of patterns. Fedora Hats are very popular fashion accessories these days. Patterned Fedora Hats are sharp and they are available in different colors and styles. Choose from our patterns that include animal prints, camo, floral, and glitters to name a few. If you are looking for a crushable fedora with subtle designs, you can opt for Straw Fedoras. Made from straw, it looks very attractive and you can take them to the beach or to a stroll in the park. It is a simple Fedora Hat that can make a lot of statement. But if it is fashion-forward fedora hats you like and you are not afraid to try anything bold, then this Glitter Fedora Hat is perfect for you. Adorned with glitters all over, it can provide great accent to both day and night wear. The light simply reflects off from the glitters. Now if you want to wear muted design hats yet with a bold appeal, try the Stingy Brim Hats. We have a great selection of Trilby Fedoras aside from the various patterned fedoras in this page. Just click on the various link for a listing of more choices.